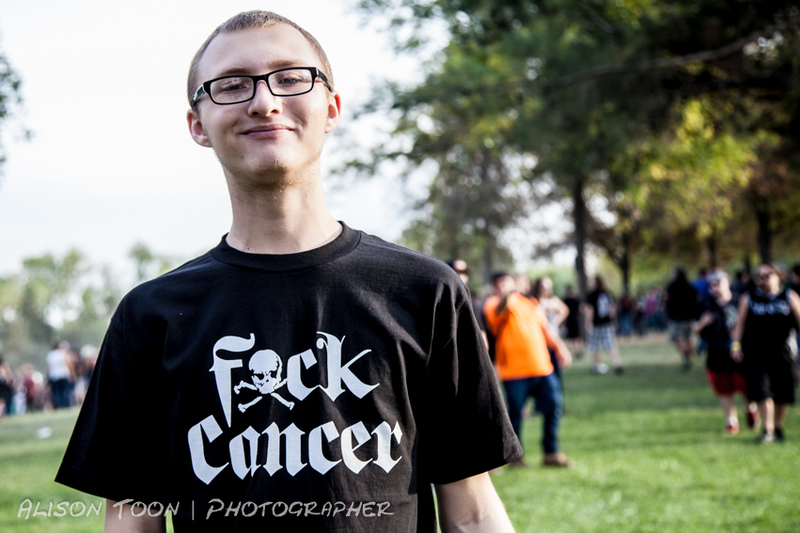 Toon's Tunes : Aftershock 2015, Rhynan Fay, Crazy Dave's, ESP guitars, all the performers... and FXCK CANCER!!! Aftershock 2015, Rhynan Fay, Crazy Dave's, ESP guitars, all the performers... and FXCK CANCER!!! Photos and reviews from Aftershock coming very soon--and yes, it was a brilliantly-awesome weekend--but first, I want to show you how this music festival has brought some great happiness to the bravest young man I know. In case you haven't been following Rhynan's story, he was diagnosed with cancer at the beginning of May this year. Going from totally-healthy-and-fit to knowing that the big C was attacking his body and his life. Not one type of cancer, either: four different strains, all incredibly nasty. Two surgeries multiple rounds of chemo, and a few long-and-hard months later, Rhynan is well on the way back to full health. He's a survivor, and he is totally amazing. And Aftershock happened!!! And what a wonderful thing. Aftershock, Ashton-Magnusson Media, FXCK Cancer, Crazy Dave's Musical Experience, Aftershock bands, musicians, everyone, made this weekend something that this young man will remember for a very, very long time. ESP Guitars and Crazy Dave's Music Experience donated a FXCK Cancer guitar for Rhynan to have signed during the weekend--and it was, by some great musicians who care, a lot. He was invited on stage to watch his favourite performers up-close. He was given the weekend that a lifetime of memories are built on, and even more hope for the future by all sorts of inspirational people. It was absolutely FXCKING marvellous and so kind that it brings tears to my eyes. Anyone out there who would love to have had this weekend's experience, and watch Marilyn Manson and other bands from the side of the stage, and to meet all your heros: ask Rhynan what it was like to be diagnosed, then have major surgery; about the affects of chemo, and how it makes you feel so very, very sick, and what it changes in your dreams of the future, and how you build a new, stronger future for yourself; ask him about finding out that neither the original surgery nor the nine rounds of chemo were enough; ask him about the second, invasive and many-hours-long surgery he endured. Ask his mom and dad what it felt like to know that their eldest son was so sick, and the feeling of helplessness and wanting to fix it all, while they could do nothing, and when all they have ever done is protect and raise their child in the best-possible way; ask anyone else who has survived cancer, or watched loved-ones suffer in terrible ways. Ask all of that, and then think how wonderful it was that all of these people and organizations did so very, very, very much to make this weekend Rhynan's very-very-special weekend. And then, go to FXCK Cancer and see what you can do to help. Because they make people's dreams come true. And I say, FXCK Cancer, FXCK Cancer, FXCK cancer!! !